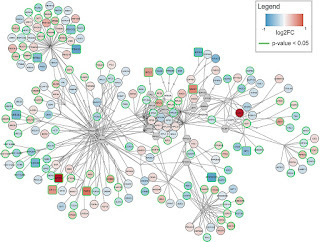 chem-bla-ics: New paper: "Beyond Pathway Analysis: Identification of Active Subnetworks in Rett Syndrome"
New paper: "Beyond Pathway Analysis: Identification of Active Subnetworks in Rett Syndrome"
Figure 4 of the article. Ryan Miller and Friederike Ehrhart worked together in this paper on furthering our understanding of the Rett syndrome (doi:10.3389/fgene.2019.00059). They looked at the following: our biological pathways are social constructs that help us think and talk about the biology in our body (and other animals, plants, etc, of course). What if we ignore the boundaries of those constructs, can we learn the pathways? Turns out, sort of. Using PathVisio, WikiPathways, and Cytoscape's jActiveModules they developed new modules that capture a particular aspect of the biology, and, as usual, color the transcriptional change on top of that. The Methods is richly annotated and all stuff is open source. The authors conclude with mostly bioinformatics conclusions. No new shocking new insights into Rett syndrome (yet, but unfortunately), but they indicate that by taking advantage of our interoperability approaches (e.g. the ELIXIR Recommended Interoperability Resource BridgeDb, using mappings from Ensembl, HMDB, ChEBI, and Wikidata) pathway resources can be integrated, allowing these approaches. Mind you, each pathway, and regularly down to the gene, metabolite, and interaction level, the information is not just built in collaboration with research communities, curated, but also backed by literature: 22494 unique PubMed references of which almost 4000 unique to WikiPathways (i.e. not in Reactome).